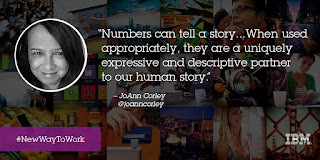 JoAnn Corley-Schwarzkopf | NewSchool Management: Have You Experienced the Power of Numbers? Have You Experienced the Power of Numbers? Comment; Though this post was written prior to an event I attended mid 2015, the premise is timely and worth reading! Look for follow up posts addressing this theme. This upcoming week, I have the great fortune of attending IBM's Insight Conference in Las Vegas. Its focus is looking at the role of analytics in work, commerce and mobile. I know it's going to be a powerful event! And... it got me thinking about numbers. I've never considered myself a "numbers gal" as they say. Yet, in my world (talent management) more and more numbers are showing themselves to be a meaningful partner. And...that got me thinking about how essential numbers are...in well...just about everything! Let's start with when we were born - yep numbers are attached. The ability to live -- gotta have money -- yep numbers are attached...you get my drift. So here's a confession. I've taken numbers forgranted. Their role is so common and integrated into my existence, I don't think about them or appreciate them. And yet recently, I've been challenged to take them more seriously. I recently completed an executive coaching /consulting engagement and wanted to show the extraordinary value and success of the experience. Along with providing a detailed debrief, in partnership with my client, I calculated the financial impact, including return on investment in real numbers and percentages. The numbers magnified the success of the engagement and amplified my own sense of accomplishment! Additionally, I recently read an article that was of great encouragement about a California company, CA Technologies, that reconfigured its recruiting process to more adequately reflect its values and brand. As an HR professional and career coach, sometimes it's down right embarrassing how candidates are treated. They didn't want to be one of those companies. “No one ever contacted me.” Most people who have ever applied to jobs online have experienced this. Statistically, only 25% of completed job applications will ever get reviewed by a hiring authority at an employer. Very few will ever receive a response from a real person. In an effort to improve our candidate experience, based on feedback from job candidates in 2014, we audited our process to find only 12% of the 100k applications received annually were being reviewed. Our solution? In January of 2015 we implemented a small team in our Hyderabad office, called Talent Assessors, to review and vet each application and respond to the applicant with a personal note letting them know if they would move on in the process. The program was spearheaded by Becca Sil, Operations Manager from CA’s Talent Acquisition team. We now have 3 resources on the team personally responding to every applicant within 2.5 days. We soon began receiving feedback from applicants that indicated we were on the right track. We published one such note in an article on Linkedin that received some interesting awareness. 25,000+ applications have been reviewed to date. 60 hires have been made from this pool that might have gone previously un-reviewed. Annual cost of the program is less than $20k. “The Talent Assessor program has helped to improve the overall candidate experience at CA Technologies, by ensuring that every candidate, qualified or not, receives a personalised response from a member of our team. We now have much more meaningful data to allow us to focus our marketing strategies in the most effective areas,” said Becca Sil. “No one ever contacted me.” That doesn’t happen here anymore. As I've begun to pay closer attention to data and the role of analysis, I am now a convert. A convert to what you may ask? A convert to the significant role numbers and their analysis can play to get more of the outcomes I really want personally and professional for myself and my clients! For me, their use will become a permanent part of my professional toolkit. Numbers can tell a story. Numbers can amplify a need. Numbers can help us see truth. Numbers can give voice to the human experience when perhaps no one will listen. When used appropriately, they are a uniquely expressive and descriptive partner to our human story. I am looking forward to learning more about the power of numbers at Insight 2015 and I'll be sharing my findings and observations in real time on Periscope and Twitter under the hash tag #IBMInsight and #Newwaytowork @joanncorley along with being a featured guest of a tweet chat - #NewWaytoWork tweet chat - Save the date- 10/27 5:30pmET. See you there!